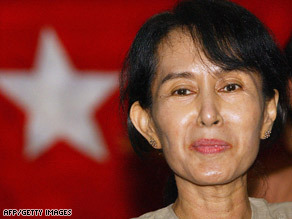 The trial of Myanmar opposition leader Aung San Suu Kyi is expected to last another two weeks, her party said Thursday. Suu Kyi’s lawyers will petition the country’s Supreme Court to reinstate two defense witnesses. Prosecutors at the Nobel laureate’s trial have allowed only one witness to take the stand. A ruling from the court will take a few days — and the trial cannot be wrapped up if a decision is pending, said Nyan Win, spokesman for Suu Kyi’s National League for Democracy. Closing arguments in the trial at the Insean prison compound near Yangon had originally been scheduled for June 5. It will resume Friday. Prosecutors say Suu Kyi, who turns 64 on June 19, violated her house arrest by offering temporary shelter to American John William Yettaw, who swam to her lakeside home May 3. Suu Kyi said she doesn’t know Yettaw, didn’t know of his plans and denies she did anything wrong. Suu Kyi is charged with subversion. The 53-year-old former U.S. military serviceman from Falcon, Missouri, testified repeatedly that God had sent him to Myanmar to protect Suu Kyi because he dreamed that a terrorist group would assassinate her. If convicted, Suu Kyi could receive a sentence of up to five years in prison.